Saturday night featured two heavy contenders for the Stanley Cup. The San Jose Sharks and Nashville Predators would face off for the last time in the regular season, and it promised to be great game. Conditions weren’t necessarily perfect, the Sharks were missing their best player, Erik Karlsson, and Kyle Turris was a healthy scratch. Nevertheless, these two titans went to war on the ice and it was a pretty fun game. There was some back and forth, a quick goal or two, and as always, Martin Jones cost the Sharks in ways their opposition never could. The Sharks are one of the best teams in the NHL on the spread sheet. They dominate other teams with a fast, yet heavy game that wears opposition into dust as the clock ticks down. The only chink in their armor is their abysmal goaltending, and the Predators obviously knew it. If the Predators were going to win, they would have to make the most of every opportunity, because the Sharks typically allow very few. The stats for this game prove it. I’d love to tell you that the Predators beat the Sharks through a solid 60 minute effort, but that wasn’t necessarily the case. The Sharks controlled 56.12% of shot attempts as well as 51.11% of shots on goal. The tide of the game was vicious and not always steady, but it felt like for every quality scoring chance the Predators had, the Sharks would come back with two more. The stats actually do prove that one as the Predators mustered only six high danger chances while the Sharks doubled that with 12. The heat map above kind of shows it, while the Sharks created more, they couldn’t put it home. I’m not sure the issue for them was shooting talent, but rather who they saw in net. I’ll come back to it later, but Juuse Saros was far and away the best player tonight. Meanwhile, Martin Jones was Martin Jones. I can wholeheartedly say that the Predators did everything they needed to win. It wasn’t pretty, and I’m not sure if they could win this way in a seven-game series, but the Predators left San Jose with two points. Let’s look at how they did it. As always, JoFA led the way. They didn’t dominate ice time as they usually do, but they had their fair share. They received some healthy zone start sheltering, but handling Tomas Hertl and company is no small task. Their work along the corners was excellent and it feels like they’re finding an extra gear after being separated by injury for so long. Their work in the offensive zone was as good as promised, but Ryan Johansen’s work in the defensive zone was top notch. His ability to dominate 200 feet of ice is going to be greatly needed come playoff time. There were a few hiccups in the defensive zone, but nothing major. I think we can all agree that it’s time to end the second line center Nick Bonino experiment. I get it, you pay him four million dollars per season and you don’t want to look like you got fleeced, it’s ok. It happens. Just stick him on the fourth line and take the loss. Give Sissons and Smith the promotion they rightfully deserve. I like Jarnkrok and he had a good game, he made a great pass to create the first goal, but Granlund is easily better than him. Also, stop throwing Simmonds to the wolves. His five on five play needs to be sheltered in terms of competition. This line saw “third line” competition and got beat everywhere on the ice, maybe it’s time to try something new. The third line has been really good so far. Sissons is playing his best hockey ever and Craig Smith seems to be heating up. I think a bump in ice time is in order. Realistically, this line didn’t do much after the first two minutes of the game, but that’s fine. They were tasked with shutting down the Couture line and they did a decent enough job. They did give up a goal but that’ll happen. I wish they produced more in the high danger area, but Saturday’s showing was certainly above average. This fourth line is really something, man. I get there’s something going on with Turris, but this fourth line isn’t exactly holding their own. Their “delta” numbers look fine but they played the Sharks’ fourth line, which features Michael Haley, the only player who might be worse than Cody McLeod. Still, the fourth line couldn’t produce anything of merit despite favorable zone starts. I guess it’s fine because nothing bad happened, but eventually luck will catch up with them. Roman Josi and Ryan Ellis had a weird night. They faced a great forward unit and did ok in handling them, but they never looked on top of it. They got caught chasing in their own zone and fumbled the puck a few times on the breakout. Besides that, I thought they did an excellent job at combating the rush, Ellis especially, and didn’t make too many mistakes. Goaltending bailed them out a few times, but that’s a common theme for tonight and the last two seasons. I know I gave them a “B”, but P.K. Subban and Mattias Ekholm had themselves a night. The deck was stacked against them and they played hard minutes, but they came out with their head above water. Ekholm was a bit more quiet than usual, but his play was exactly as invisible as it needed to be. I know that’s a funny statement, but what I mean is that he never did anything that had me saying “oh no Ekholm”. He showed up, did his job to the letter, and promptly got on a plane back to Nashville. Subban, on the other hand, was noticeable all night. His quick decision making skills were on display as he created at least seven successful break outs. His sublime passing kept the Hertl line from establishing full minutes of zone time. I only gave them a “B” because of their Corsi delta, but that high danger chance delta is a beauty. The third pairing is bad. I hate to tell everyone, but if you haven’t seen it yet, they’re not too good. They faced the Melker Karlsson line and finished with negative deltas in pretty much every stat. It’s bad, and Peter Laviolette knows it. That’s why they saw about 10 fewer minutes than the top four did. This could be a headache as the playoffs approach. Juuse Saros, take a bow. What an absolutely incredible performance from the kid. He was everything the Predators needed him to be, and he was absolutely on top of any rebounds the got kicked out. His growth, this season alone, has been incredible to watch. This might still be Pekka Rinne’s team, but if Saros can consistently play like tonight, he’s ready to take over. If the goalies were swapped, this wouldn’t have been as close. The second and third periods were not all that kind to the Predators, and Saros made up the difference. Everyone on the squad owes the young Finn a nice steak dinner. 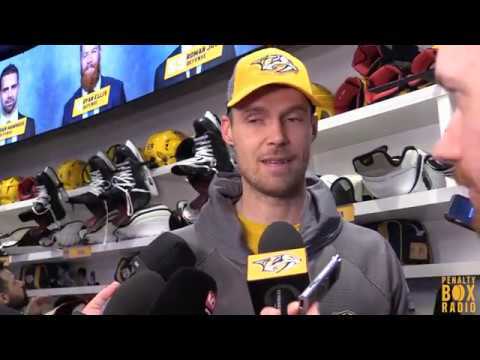 PBR Live: Where’s the urgency for the Preds?